Chances are, on the nights that you crave chili, you also crave cornbread. 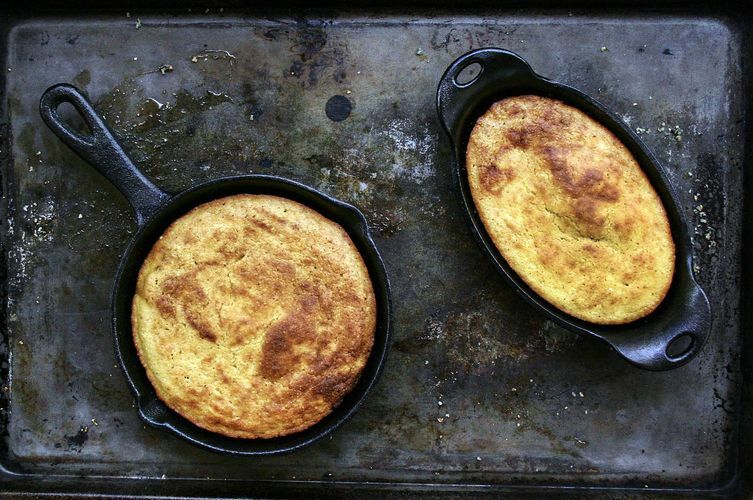 And if you crave cornbread, you probably want the best, no-nonsense cornbread, the kind crisped up in a cast iron skillet, and with bacon grease as the fat component. (If you haven't tried this yet, now is the perfect time to give it a shot.) 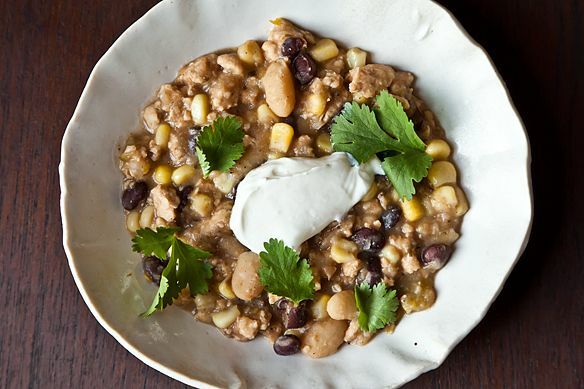 Chili is usually a several-hour committment -- but this recipe cuts some corners (without sacrificing taste) and comes together with pantry items you probably already have. We're assuming you have 1 white onion, 2 cloves garlic, some vegetable oil, dried oregano, chili powder, black pepper, cinnamon, all-purpose flour, baking powder, and 2 eggs. If not, add those to the shopping list, too. 2. Grease a cast iron skillet with bacon grease and place in the oven while it heats. 3. For the cornbread: Mix the cornmeal, 3 tablespoons flour, 1 teaspoon kosher salt, and 1 teaspoon baking powder in a medium mixing bowl. Cut in 3 tablespoons bacon grease with your fingers or two knives, mixing well until you have a sandy texture. 4. Combine the eggs and buttermilk, add to the dry ingredients, and mix to combine well. 5. Pour the mixture into the hot skillet and bake for 20 minutes. 6. While the cornbread is baking, chop the onion and garlic finely. Add to the oil in a large Dutch oven. Sauté over medium high heat until soft and translucent. Do not brown. Remove the onions and garlic to a bowl and set aside. Add the ground chicken to the pan and cook until browning slightly, breaking it up into small pieces. 7. Mix the oregano, cumin, chili powder, pepper, and cinnamon in a small bowl, then sprinkle over the chicken. Add the onions and garlic. Pour in three cups of water and bring to a boil. Lower heat to a simmer and cook until the water has reduced by half and the chicken is cooked through. 8. Meanwhile, drain and rinse two cans of white beans. Place the beans in a blender with the chicken broth and purée until smooth. Drain and rinse the remaining white beans and the black beans. Pour the puréed beans into the chicken mixture, stir well and bring to a boil. Lower the heat to medium, add the remaining drained beans, corn, and green chiles and simmer until cooked through and thickened, about 30 minutes. 9. Serve in big bowls topped with grated cheese, sour cream and chopped cilantro. Invert cornbread onto a plate and serve crispy side up. Can I substitute something for the bacon grease?